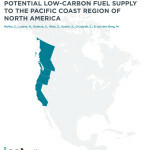 A new study by ICF International, commissioned by a group of investors and clean fuel producers, was released today and found that faster-than-expected growth in many clean, alternative fuels would allow California’s Low Carbon Fuel Standard to be met out to 2020. 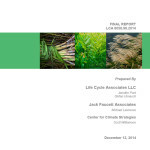 The ICF report looked at eighteen different alternative fuel technologies that are reducing carbon pollution and helping move the state beyond oil dependence. 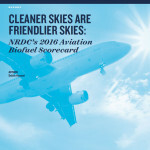 The Low Carbon Fuel Standard (LCFS) is “driving investment in low carbon ethanol, biodiesel, renewable diesel, and biogas.” One of the primary goals of the standard is to reward innovation and improvement in the fuels industry. 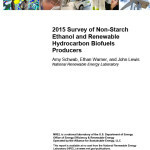 “Compliance with the LCFS can be achieved through modest changes and a diverse supply of transportation fuels.” In general, three different scenarios show that many cleaner alternative fuels – from electric transportation, to cellulosic ethanol, renewable diesel, and biodiesel and natural gas used in trucks – will be available to allow the standards to be met. 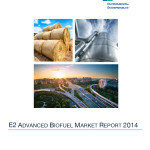 Despite delays in some fuels like cellulosic ethanol, other like low-carbon biodiesel and renewable diesel are being produced in larger volumes than expected. The performance-based, flexible nature of the standard allows any number of clean fuel technologies to be utilized and incentivized. One of the interesting trends across all three scenarios is that the clean, alternative fuels continue to improve over time. 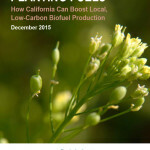 For example, the 1.4 billion gallons of ethanol that has been used historically in California and largely corn-based increasingly improves and shifts to lower carbon feedstocks, including cellulosic-based fuels such as those made from grasses and agricultural waste. 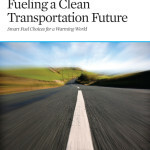 The report also identifies the benefits of additional ways to reduce carbon emissions, including expansion of off-road electrification such as electric forklifts, buses, and rail, as well as reducing emissions from extracting crude oil, a process that can release high amounts of carbon pollution). The ICF study comes in direct contrast with the now heavily debunked, oil industry-sponsored study that claimed there were few ways to reduce carbon emissions in the transportation sector and most alternative fuels would be largely unavailable through 2020 (see my previous blog). Fortunately, the LCFS is working as intended with nearly 3 million metric tons having been reduced through the end of 2012 and the oil industry over-complying with the standard. 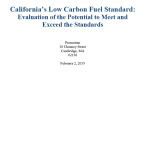 The ICF study analysis provides further proof that setting a clear goal and letting industry find the best way to reach it can spur the type of innovation and investment in California that is not only diversifying our fuel supply, but benefiting the environment. Click here to see the full press release from CalETC.